Key redevelopment opportunities in and around Horsham have been identified in a new growth deal signed by two local authorities. Horsham District Council and West Sussex County Council have jointly committed to a number of shared strategic priorities to deliver new homes, create jobs and boost economic prosperity in the area. Major projects in the deal include infrastructure required as part of large-scale development at the North of Horsham and West of Horsham sites, redevelopment in Hurst Road, a new Horsham town centre vision and the planned Horsham Enterprise Park on the former Novartis land. The growth deal will act as a joint undertaking by the two local authorities to combine resources to deliver these shared priorities. Ray Dawe, leader of the district council, said: “Horsham District Council is working to increase economic growth, maintain and create new local jobs and bring continued prosperity to the district and our residents. Louise Goldsmith, leader of WSCC, added: “The Horsham district growth deal provides a real opportunity to work formally together on a range of ambitious plans for Horsham and the surrounding area. It means we can secure resources and investment to deliver much-needed improvements to local infrastructure including a new fire station and training centre. “I know from other district deals that collaborative working with the district council and other partners creates an environment to boost the local economy, helping both local residents and businesses to not only prosper but also to benefit from the improvements planned. 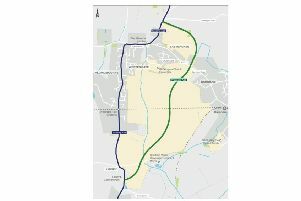 The West of Horsham developments include improvements to the Newbridge, Farthings Hill, Great Daux and Robin Hood roundabouts, while an improved A264 Rusper Road roundabout is due to be delivered as part of the North Horsham scheme. A new signallised junction is planned between Rusper Road and the A264 Moorhead roundabout. • Options to increase parking capacity and possible residential schemes for the Horsham Railway Station and RSA car park sites east of the railway line. The two authorities are also looking to deliver a masterplan for the Hurst Road area to facilitate the redevelopment of the existing fire station, police station, magistrates court, the youth club, Arun House, ambulance station and Royal Mail sorting office. The combined sites could potentially deliver around 300 new homes, a hotel and conference centre and new commercial and employment space. A new blue-light operational and training centre on county council land off the A24 is being proposed, while alternative off-site youth provision is being explored. A satellite station close to the town centre would be created, with an on-call fire engine and public-facing front counter for police. The county council is proposing new employment space and homes on the former Novartis site off Wimblehurst Road. The district deal can be viewed in full here.